The most interesting part of the movie is that the battle between the good and the bad is the battle of wits rather than the most common fist fights. Fifteen minutes into the movie you realize that this is not just another movie and the classy introduction of the hero (Vijay) deserves a special mention. The whole dedicating to Indian Army thing is certainly not a marketing gimmick as the storyline shows what an intelligence agent in the army is capable of. There are a lot of dialogues that will make you feel you could have applied for the Indian Army. Cheesy it might seem, but it is true. 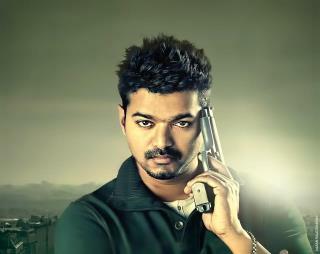 Vijay carries the whole movie on his shoulders and he has been the director’s man in this movie. His neat and casual dressing tailor-made for his physique makes the girls go Wow right from the start of the movie till the end. The costume designer will go places for his contribution to the movie. The cinematography by Santosh Sivan deserves the red carpets as it has been the best in the recent past with attention to detail. The songs and the action sequences have been captured with freshness and flair respectively that leaves the audience awestruck and the fans hooting once in a while. It is the movie’s second hero. Kajal Agarwal plays Vijay’s love interest and she has done a decent job as a heroine given the scope of the movie confining mostly to the cat and mouse theme. She contributes to the fun part of the movie with much help coming from veteran actor Jayaram and Vijay’s seasoned friend Sathyan. It has been quite a while in Tamil Movies where the Villain is as brilliant as the hero and Vidyut Jamwal has carved a niche for himself being the silent but a ruthless terrorist lead. His physique and his gifted martial talent comes in handy in the climax yet people love to see the hero win at the end of the day. The best part of the movie is that there is not too much of a commercial element yet it appeals to a wider variety of audience with its style and substance. Harris Jayaraj has scored the music and few of the tracks are chartbusters for a few weeks now.The Background score being very much in line with the teaser contributes to the interest element and a Vijay fan will certainly have goosebumps once in a while. The movie drives home a strong message that there are some people out there risking their very lives so that the people living in the country can lead a normal life. Few of the dialogs that Vijay delivers strikes this note perfectly and it is simply the best movie to watch out for as it is a sensible movie that entertains all age groups. How to Sell without Selling? Understanding Jallikattu and why thousands are protesting against the ban?